A specially developed bacterial preparation for use in marine and freshwater aquariums. A specially developed bacterial preparation for use in marine and freshwater aquariums. Contains a variety of beneficial bacteria cultures, which independently carry out their work in the aquarium. It stabilizes the biological cycle of water and achieved sustainable natural conditions in the aquarium. The bacteria in MICROBE-LIFT / Special Blend (ML / SB) support the reduction and composting of organic matter and put the same elements as nitrogen and sulfur to build up in the aquarium. 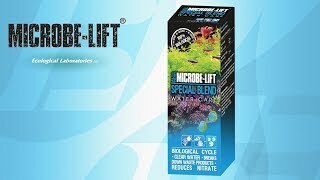 MICROBE-LIFT / SB removes chlorine, chloramines and heavy metals, you use this MICROBE-LIFT / XTremeMICROBE-LIFT / Special Blend is in conjunction with MICROBE-LIFT / TheraP the optimal biological solution for your aquarium. Add the bacteria directly added to the aquarium or in the filter.